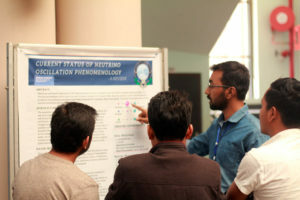 The Department of Physics organised a two day national conference on “Trends in Modern Physics 2019 (TiMP 2019) on 22-23 February, 2019. 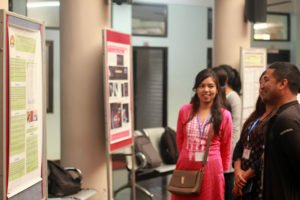 A large number of participants from various universities, colleges and institutes of Northeast India and a few delegates from other parts of India and abroad presented their research in the event. At the inaugural session, Dr. Samrat Dey, Head, Department of Physics said, “It is a felt need by the Department to hold yearly national conferences on ‘Trends in Modern Physics’ as in Northeast India no such yearly conference of Physics, where young researchers can share their ideas and get suggestions and helps from renowned academicians of the region and other parts of the country”. After Dr. Ngangom Aomoa presented a brief overview of the conference, the plenary talk by Professor A. Srinivasan, Dean of Faculty Affairs, Indian Institute of Technology Guwahati followed. Professor A. Srinivasan stressed on the importance of conducting such regular conferences and the need to grow together in science. The conference then proceeded with four oral technical sessions with a number of invited talks and contributory talks dedicated to the trust areas of plasma physics, astrophysics & cosmology, material & nanophysics, particle physics and nuclear physics, stretched during these two days. The invited speakers included Dr. Mayur Kakati from Centre of Plasma Physics – IPR, Guwahati and Dr. Sumita Sharma from Institute for Advanced Studies in Science and Technology, Guwahati, Dr. Rajib Kar from Bhabha Atomic Research Centre, Mumbai, Dr. L. Herojit Singh, National Institute of Technology, Manipur and Dr. Dulen Saikia from Joysagar College, Sibsagar, Prof. Atri Deshmukhya from Physics Department, Assam University, Silchar, Prof. B. N. Jyrwa from North-Eastern Hill University, Shillong and Dr. Joydeep Ghosh from Institute for Plasma research, Gandhinagar. 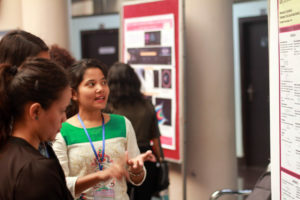 This was followed by a poster presentation session wherein a large number of posters were presented. The conference ended with a valedictory session where Fr. Stephan Mavely, Vice Chancellor of ADBU, congratulated and thanked the Physics Department, ADBU, for taking up such initiatives. Dr. Ngangom Aomoa was the convener of the conference and Mr. Parag Bhattacharya and Mr. Dipjyoti Sarma were the co-conveners. Around seventy participants attended the conference.